The beauty and natural wonders of Missouri’s most spectacular state park are truly special. 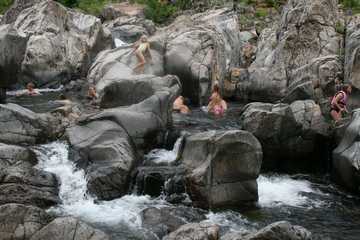 Here, on summer days, generations of swimmers have clambered over and washed through the numerous potholes and chutes carved through ancient purple-pink granite rock, in the gorge of the Black River East Fork. Such unique geologic features are known locally as “shut-ins” because they are the result of the water’s flow being confined or “shut-in” by hard igneous rock, formed during volcanic eruptions more than a billion years ago. 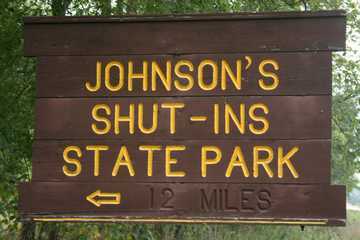 This natural water-park playground is the showcase feature of the 180-acre Johnson’s Shut-Ins Natural Area, but is only a small portion of the entire 8,549-acre state park. The adjacent 1,100-acre East Fork Wild Area has a wide range of natural upland and bottomland habitats, and is dotted with open rocky glades among the forest stands of native shortleaf pines. Other jewels include the 9-acre Fen Natural Area and the 18-acre Dolomite Glade Natural Area. Also nearby is the 4,874-acre Goggins Mountain Wild Area, the state’s largest, with its hiking and equestrian trail and the park’s new campgrounds. This park made news in December, 2005 when the old campgrounds, store, office and other infrastructure were destroyed in the flood resulting from a breach of the Taum Sauk hydroelectric plant reservoir atop nearby Profitt Mountain. Access to the park was limited for the past three years, while extensive restoration was underway. However, a popular feature of the reopened park is the Scour Channel from the flood’s course down the side of Proffitt Mountain, which can be viewed from a new interpretive center.